When we introduced DQ about the giggling qualities of the funny pages at age 4, she was immediately addicted. She looked forward to the colorful entertainment each week (and weekday). Plus it was a great way to introduce reading. It was so neat to see her at the dinner table with mom and dad, all of us with our specific section of the newspaper! Our oldest loves reading the funnies to this day. Simply hooked on them. And, on one in particular. Created by longtime friends Rick Kirkman and Jerry Scott, Jerry writes the strip, drawing on his first hand experience with his children while Rick is the gifted artist that animates the ideas. The strip follows the adventures of a mid-30s career couple, Wanda and Darryl MacPherson and their 3 zany kids, Zoe, Hamish and Wren. The strip has enchanted new parents, grandparents and kids alike since it first appeared on the comics pages in 1990. Baby Blues now appears in more than 1,100 newspapers worldwide, and the adventures of America's favorite first-time parents have also been chronicled in 30 anthologies and treasuries. This comic has mimicked our lives perfectly. From the oldest daughter, middle son, and baby daughter, to the typical antics and conversations that Wanda and Darryl experience. We are the Baby Blues family! I have an opportunity to host a Q & A with creators Rick Kirkman and Jerry Scott with YOUR help! In my comments section, leave a valid question for Kirkman and Scott. What would you like to know about their lives, their comic strip, their inspirations, etc. That's it! At the end of the contest I will randomly draw TEN questions to submit for the interview. 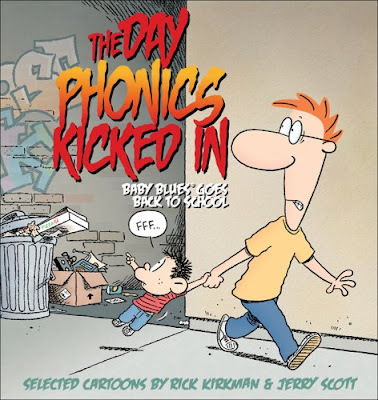 The TEN winners will each have their question published on my Q&A post next week AND will each receive a copy of the Baby Blues anthology, The Day Phonics Kicked In ($12.99 retail value)! How cool is that?? Contest ends tonight, 10pm Pacific time. Good luck and for more information on the comic strip, Baby Blues, check out this website, http://www.kingfeatures.com/features/comics/babyblue/about.htm. Look for the interview with Kirkman and Scott coming soon! I'd like to know how many of the story lines are ones actually experienced by the strip creators. All too often I read Baby Blues and go "OMG, MY kids did that too!" Do your comics ever mimic your childhood? How fun! My son (age 9) loves reading Baby Blues! In fact we currently have 2 of their strips hanging on our fridge right now! :) I would love to ask if they anticipated (or are even aware of) young readers. I know my son loves reading the comic because it does mimic our lives. Did they created the comic strip to entertain parents, or did they anticipate children identifying and reading along? Good luck with your interview! What a great opportunity! I LOVE comics! And cartoons, actually (have you seen Gogo Riki? so cute!) I have been a huge fan of Baby Blues, but am just getting the paper again, so I'm behind. I guess my questions - Did you go to school for comic strips? If so, which one? (I have a niece that seems to be a budding cartoonist!) And I know the strip is in real time. Are they going to have any more babies? Thanks for the awesome interview, Jen! And thanks for being interviewed guys! You write the character of Wanda so well, making her a believable hard working stay at home mom. Is the character based on your wife, and if so, does she feel it's an accurate depiction of her? Which character most closely resembles you as a parent or as a child? i would love both of them to answer that and ooooh I want that book to give my dad for Christmas because we constantly share the strip with each other!! Your strip has always been one of my favorites, even before my son was born in 1997. I now have 3 children--Zach, Zoe & Zienna, and I need to tell you that although Zoe is my middle child, she and your Zoe are IDENTICAL! I know that you base your strip on your children, but how closely based is it? Have your children actually done the things that Zoe, Hammie & Wren do? Thank you for the most entertaining (and family friendly) comic strip around! Ok delete my other comment...here is one. What inspired you to become a comic strip writer/cartoonist? Was it always a lifelong dream? 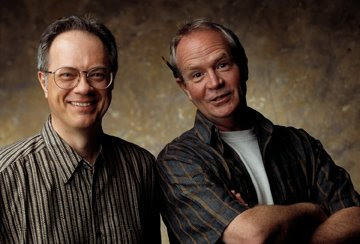 Who are the main inspirations for your comics? Why did you start the comic strip? Was it an outlet to relieve the pressure of parenting or just a matter of there were too many hilarious moments to NOT make a comic out of it all? Crap! It's 11:45pm my time. I don't remember which time zone you're in, but I'm going to cross my fingers that I'm not too late! Baby Blues is my absolutely favorite comic strip EVER and like your family, it's been a perfect match for our family---girl/boy/girl, stay at home mom, etc. Do you also have 1 boy & 2 girls in your families? Or do you draw Hammie's silly boy antics from your own childhood shenanigans? Wow, I missed this one. Can't wait to read your interview. Hi, btw. I came here from Happy Hour Sue...I think.